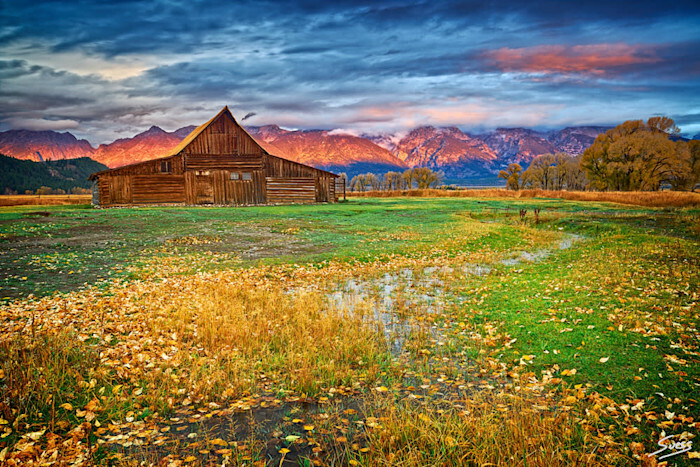 I photographed this in the fall of 2015 during my annual fall photo workshop at Grand Teton National Park in Wyoming along Mormon Row. At first light we had complete cloud cover, but then for a little while we had some incredible light as the sun found some holes in the clouds to partially light up the Teton range. None of my students were brave enough to stick their tripod and camera in the rivulet as well as stand in it so I placed mine there. While running back and forth making sure each of my students were getting the shot, I was able to fire off a few shots myself and this is the result. Grand Teton National Park during fall foliage in Moose, Wyoming, at barns along Mormon Row and Antelope Flats RD for sunrise with clouds.